Rammstein is a powerful German dance / industrio-metal music band. They describe themselves as "tanzmetal", meaning dance / metal. Rammstein was formed in 1993 by an assembly of factory-weary proletarians raised in East Germany. They took their name (adding an "m") from the location of a German tragedy, where 80 people were hurt and killed as the result of a crash during an American Air Force flight show. The literal translation of "ram stein" is a battering ram made of stone. Word of Rammstein's horror romanticist blend of theatre and music spread like wildfire. Till Lindemann would sing entire songs engulfed in flame from head to toe. The band's first album, Herzeleid (or Heartache), built on the grounds created by the band's live reputation. 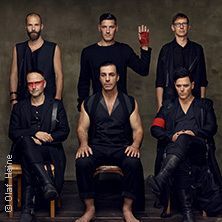 Scaling the German charts (and remaining there until the release of the second Rammstein LP some two years later), the album also introduced the band to the world outside of the Germany / Switzerland / Austria region.